Quick-Step Floors' Enric Mas has taken his second victory in the WorldTour at the 20th stage of the Vuelta a España. This win puts him in the second place of the final podium of the race. 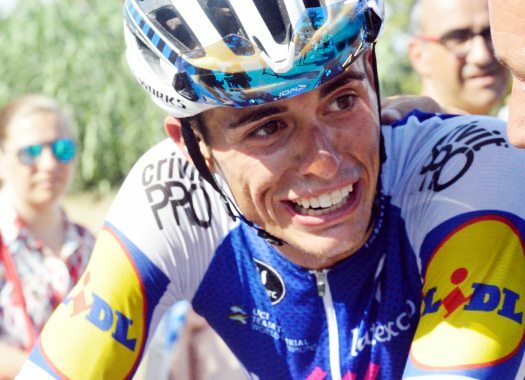 The Spaniard was part of an escape on the last climb along with Miguel Angel Lopez (Astana). The duo arrived together to the final kilometre and Mas did a very efficient sprint to take the stage victory. "Every day I watched the video of (Alejandro) Valverde winning here in 2012 and I was thinking 'I have to take the corner before him. I need to sprint before the corner and then do the last 50 metres full gas'," he said at the end of the stage. "And I did it like this. I went full gas until the corner, I took the corner and then I kept going full force." Earlier in the year, the rider had already taken his first WorldTour victory at the sixth stage of the Vuelta al Pais Vasco. "This one and the Pais Vasco victory are the biggest victories of my career and I'm very happy with this." Spanish media have been comparing him with former rider Alberto Contador, but the rider prefers another name. "No, I'm Enric Mas. I hope one day I can maybe get half of his victories. I think that would be enough," the Spaniard commented. "But yes, I'm Enric Mas. I really liked how he raced and sometimes when I can, I try to race like him."